Sorry, those commercials get stuck in my head. Sean was home early from work today, 3 hours early!! That gave me leave to play around in the kitchen for supper. It was exciting. I never get to do that anymore! We've just started Brianna on foods with spice, she is getting pretty tired of her usual choices. So here it is...Thai Chicken Stir Fry!!! Sort of. That's what I'm calling it, anyway! Saute chicken breast pieces in a small amount of olive oil. I salted and peppered them, and then added 1 Tbsp of the Thai spice while it was cooking. Then, add all the vegetables, mushrooms, and water chestnuts. Stir. Add salt and pepper if desired. Add chili powder and garlic. 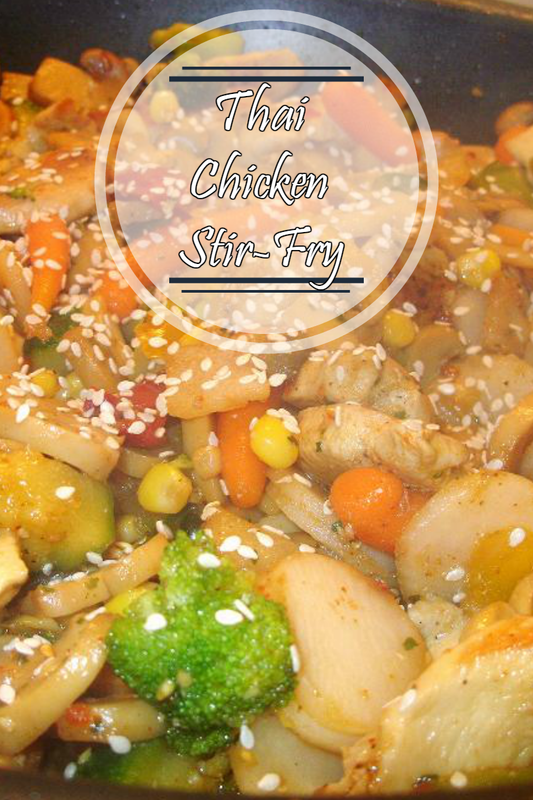 Stir-fry for about 5-10 minutes, then pour sauce over. Microwave red pepper jelly and honey in a small bowl for 10 seconds or until slightly runny. Add remaining ingredients, stir, pour over stir fry! This recipe for the sauce was created because I didn't realize that I was out of my normal sauce ingredients handy. It is surprisingly tangy and absolutely fabulous. It made just enough to coat everything and give it more flavor, but not enough to be used as a sauce with rice. We did serve this over rice, and it was SO GOOD. Best new dinner I've made in a while. I hope everyone enjoys! DISCLAIMER:: I cook without measuring. All spices are approximate! I have a good eye, though! Hey, I love this sauce recipe!! I'll have to try it. I also love making stir fry, Thai food, etc. Seems like you have alot of talent in the kitchen already, I'm impressed. I wish my daughters would cook more for their family. Cooking is such fun.